The Biographical Dictionary of British Prime Ministers is a wide-ranging, comprehensive guide to the political lives of Britain's prime ministers from Sir Robert Walpole to Tony Blair. Written by some of the leading authorities on British politics this authoritative dictionary provides essential information about each premiership, including facts and analytical debate. * references and further reading. 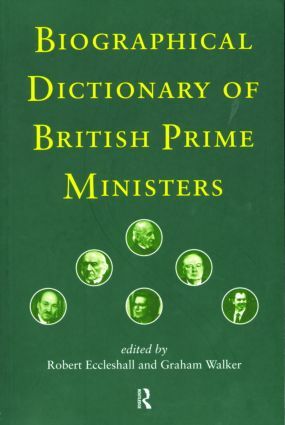 The Biographical Dictionary of British Prime Ministers addresses many of the key themes to understanding the role and impact of particular prime ministers such as: the political context; party management and reform; intra-party intellectual debate; and where relevant the evolution of the office of prime minister.